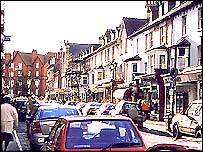 A gnarled faceless figure is being used to spearhead a campaign to improve the marketing of a mid Wales town. 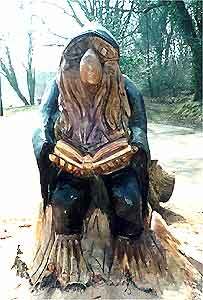 The wood carving of mythological figure - The Llandoddie - was recently completed at The Lake Park in Llandrindod Wells. Economic regeneration group, Llandrindod Wells Action Team now aims to use the carving as a marketing tool to give the town a stronger identity. And there are plans to have similar carvings of other "Llandoddies" carved in the town. The idea is the brainchild of action team members Michiel Blees and Pat Welch. "We wanted to create a corporate image for Llandrindod Wells to attract tourists and provide the town with a strong identity for people to rally round," said Mrs Welch. It was decided to create the wooden carving after a large oak tree in Lake Park was deemed unsafe and dangerous to people using a nearby footpath. After consultation with the town council it was agreed to fell the tree and use its base as the basis for the sculpture. "The sculpture is situated near the restaurant and craft shop in the park which has seen a 50 per cent rise in customers since the carving was finished," said Mrs Welch. Created by local artist Dave King, the Llandoddie image will also be used on ceramic mugs and a series of books about the character is planned. The goal of providing a saleable identity to compare with Machynlleth's town clock and Llanidloes' old Market Hall was a challenge according to Mrs Welch. "We didn't want to use the Welsh dragon so we had to come up with an original idea," said Mrs Welch. "It isn't based on a local legend of any kind so we will have to create one ourselves, a bit like Lord of The Rings," she added. More Llandoddies could be carved in the town in the near future, but only from trees that had died, stressed Mrs Welch.